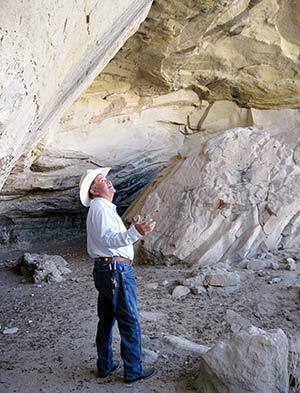 Peter Yazzie, 63, explains how water filters through the top of the sandstone cave at Tó bich'íí'hoyéé' (“Toward the Water is Hardship”), commonly condensed to “Tó Yéé'.” The spring, which bears inscriptions by Anasazi (note the red and white handprints in the background), American military expeditions and modern Navajos, once ran all year round, but now only during rainy times. A ship of stone plows through this high desert chapter, leaving a wake of scree and soil. It's an apt metaphor for the industrious people here, who don't wait around for their ship to come in. "I've often wondered," mused Lamont Yazzie, "what it is about this area that has produced so many outstanding people in so many fields -- government, education, the arts ..."
Yazzie might well count himself among that number. Holding a doctorate degree and angling for a post-doc, he is director of education services for the Navajo Nation's Head Start program. He has used his home community as the basis for his research more than once, and learned a lot along the way. Some of the first Navajo traders set up shop here Ñ trained under Lorenzo Hubbell, they didn't know why they couldn't strike out on their own. This is the birthplace of silversmith Kenneth Begay, who in the 1920s through the 1960s incorporated abstraction into his silverwork, getting himself blacklisted by local gift shops but earning an invitation to display his work at the Museum of Modern Art Ñand creating a trend that is still visible today. The landmark court cases People v. Woody, which upheld the right of Native Americans to use peyote for religious purposes, and Williams v. Lee, which upheld the sovereignty of the tribal courts, originated with Steamboat residents. Steamboat even boasts the Navajo Nation's first dentist Ñ though he didn't exactly have a degree, and no one is sure where he learned his trade or acquired his tools. Next time you're blasting through here on Arizona State Route 264 on your way to Tuba or Hopi, you might want to slow down and give Steamboat a little respect. Better yet, stop and wander around. Knock on the door of amateur historian Peter Yazzie, Lamont's dad, and he will guide you through a fascinating land. When you consider that the steamboat was invented in 1783, it's obvious that that wasn't the original name of this place. In fact, said Peter Yazzie, this area had several Navajo names. The flatter section, where his house sits, was called AdáhádinilkáÔ--"Where the Herd Came Down the Hill" after a long-ago cattle drive. Name: Named for a rock formation that resembles a steamboat. The usual Navajo name for the area is Tó Yéé', "Scary Water," for a spring at the end of a long canyon where enemies could hide behind large chunks of sandstone that tumbled off the cliffside. That's Balakai Mesa across the road in the distance (Ba Lok'aa, "Reeds Against It"). Bééshbitó (from Béézhii Bitó, "Knife Carrier's Water") is the broad canyon west of here, which Steamboat folks generally consider part of their chapter even though it is not officially within its boundaries. But the whole area is often referred to by the name of a nearby spring, Tóbich'’’'hoyéé', "Toward the Water is Hardship," usually shortened to Tó Yéé'. The spring is accessible via a long canyon lined with crumbling sandstone walls, the perfect place to be ambushed by enemy tribes or mountain lions. Modern transportation engineers were far from the first people to discover the broad floodplain between Black Mesa to the north and the Apache mountains of the south. This was a trade (and war) route for the tribes, part of the Old Spanish Trail, and a footpath linking Anasazi villages before that. On several occasions, the U.S. Cavalry swept through here, and according to oral history, that precipitated the founding of the town. "On the first or second campaign," explained Peter Yazzie, "they abducted a teen-age girl who had been left to babysit an infant and a child maybe 4, 5, 6 years old." They carried the girl off to Del Muerto, where she was raped throughout the night by the camp's senior officers. While the men were drunk or asleep, the girl managed to escape and make her way home. Along the way, she found her charges. The child's body lay at the bottom of a cliff. The infant had been buried in an anthill and apparently bitten to death. One can only imagine whether the teen wondered if she were pregnant, and what she thought of the child in her womb. At any rate, she eventually gave birth to a boy and raised him, and she must have done a good job, too, because "Freckle Neck," as he was known, became the leader of the new community that grew up around the two springs -- Tó Yéé' and Bééshbitó -- after the Long Walk. "He was very intelligent," Yazzie said. "People looked to him when they had problems." Freckle Neck didn't live all that long, but he had several wives and a lot of children. Most people in Steamboat can trace their ancestry back to him. One of Freckle Neck's more prominent sons was Hastiin Bééshbitóhi, known in English as Billy Pete, Yazzie's great-grandfather. He was a trader and a rancher, and a raiser of fine racehorses known throughout the reservation and beyond. On a major trade route that became a state highway, the people of Steamboat were well traveled and well educated. They went away to boarding school, piled into flatbeds to harvest the fields of California and Idaho, and followed the expansion of the Transcontinental Railroad as it branched north and south. Always, they brought something back to improve industry at home: hoes and shovels, blacksmith tools, new skills learned at boarding school, which they shared with their families. Today, Steamboat continues that tradition of progress. It's been a fully certified chapter since 2003 and in 2011 adopted a representative commission form of government. With only one store, which the populace already considers overpriced, the chapter has not been anxious to exercise its taxing authority. Rather, it has nurtured its entrepreneurs with business classes and microloans, explained Commission Manager Flora Nez. Steamboat has started a nonprofit through which not only the chapter but neighboring chapters can apply for grants, it's vending wood and trying to get the old police academy grounds back from the Navajo Nation so it can develop housing and a business park "inland" from busy 264. The second phase of an electric line project should have the entire chapter electrified when it's completed; a water line is just waiting on approval and bathroom additions from the Office of Environmental Health. The chapter has applied for its own housing grant through the NHA, and also has an annual housing fair to encourage its residents to explore other housing options. A youth initiative has gotten off the ground, someone has been hired to move rural addressing along, and 77 people have signed up for gardening classes and materials in a joint project between the chapter and the LDS Church. "We don't really advertise all this stuff," said Nez. "We're too busy. For this ship of the desert, it's full steam ahead."